The small village of Banastari was the site of several fierce battles between the Portuguese and the Sultanate of Bijapur of which Goa was initially a part of before the arrival of the former. The river there marked the frontier between the island of Goa and Bijapur territory below the ghats. Bijapur built a great fort there to prevent further Portuguese incursion and as a place from which to launch attacks of its own across the river. When the Governor of Portuguese India, Afonso Albuquerque, was absent for many months in 1512 on an expedition against the Sultan of Malacca, Bijapur prepared to launch a massive attack on Goa. Upon being informed of this, Albuquerque rushed to the defence of Goa. Within days of arriving, he ordered the fleet to sail along the river to Banastari. For several days it launched a relentless bombardment of the fort. 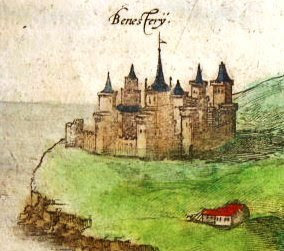 Many Bijapur bombardiers manning the fort’s defences, including Genoese and Castilian renegades, were killed. The eventual arrival of large Bijapuri reinforcements, however, quickly forced the fleet to retreat. While attending mass, Albuquerque was informed that the Bijapur Commander, Rassel Khan, was preparing to launch a major offensive on the City. Determined to outmanoeuvre him, Albuquerque rushed to a nearby hill from where he observed large Bijapur formations marching in the open country towards the City. He immediately ordered a three pronged attack causing panic within the formations and forcing a general retreat. The Portuguese then attacked the fort itself. Albuquerque’s troops began scaling the walls but seeing that there was no artillery, he ordered a temporary withdrawal to minimise losses. For two days, the troops assembled at a place called “Two Trees” between Banastari and the City, waiting for the artillery to arrive. When it did, the final and deadly assault took place. The intense artillery barrage ensured that the walls eventually gave way. It was not long before Rassel Khan signalled his desire for a ceasefire. Albuquerque was agreeable on condition that all Portuguese defectors and renegades in Bijapur service be handed over. As a matter of honour, Rassel Khan insisted that their lives be spared. Albuquerque accepted although he did not quite live up to the spirit of the agreement. Upon being handed over, he ordered the noses, ears and hands of the renegades to be cut off. In this condition they were then set free. Rassel Khan, meanwhile, withdrew his troops into Bijapur country, allowing Albuquerque - in accordance with the terms of their agreement - to occupy Banastari. He immediately set about re-fortifying the area as well as setting up extensive defences in Divar and Pangim in anticipation - no doubt - of the next confrontation with the Sultanate.